Mirabal is a Grammy-winning flautist; a performance artist of imposing presence; and, like me, a part-time farmer, which is why he has given me these seeds, to plant at my home. His admonitions are a way of “reminding” listeners about basic principles that have lived at Taos Pueblo for more than 1,000 years. The very first World Heritage Site that was a place of living, it’s a wonderful destination for thoughtful travelers. 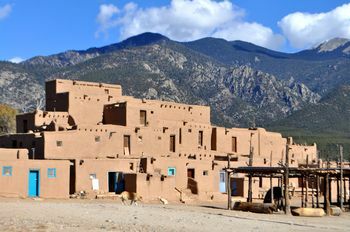 The pueblo rises above a cottonwood-clad plain beneath Taos Mountain. Red Willow Creek sings its way past like a children’s rhyme. Awful history competes with sunshine as warm as breath—the ruins of an old church hold the spirits of 150 women and children burned alive inside by U.S. troops in 1847, and the sun cures the adobe bricks with which pueblo workers maintain the oldest inhabited town in North America. Mirabal lives near the ancient pueblo, in a house where young cottonwoods fend off the westering sun, and water running in a small acequia chuckles right outside the kitchen window. Though he travels the world performing, he is also attempting to revive the pueblo’s agricultural traditions, having formed a farming company with a friend, writer Nelson Zink. Like so many things, corn may be simple—but it’s not easy. Careful care, whether in New Mexico’s kingdom of corn, or in Seattle, where I live and farm, is required to grow this most basic American food. It needs warmth and suffers no planting haste. It seeks the sun like a child growing tall and must see more light than dark. It will stunt itself if its ground is not enriched (I use chicken manure) and it may not thirst for water. Treat it with care and it yields wonders. I hesitate to call it “sacred” because the European world view so thoroughly misinterprets that term; but if you have never picked fresh corn from your own ground and brought it to the table on a late summer afternoon, you do not understand the land beneath our feet. Unlike beans, potatoes, tomatoes and chile peppers, corn does not star in any cuisine outside its original home. Yes, Italians make polenta, but tomatoes and wheat are more pivotal in the Mediterranean. UNESCO recently declared the food of Mexico a World Heritage cultural treasure, because of corn. Corn was grown from above the Great Lakes to the far end of South America; its family history is much older than the words I use to describe it. Now I have brought the heritage blue corn of Taos Pueblo to Seattle; laid it in the ground beneath my hands with care and hope. It’s two thousand years old, and I am less than that. I wrote my own planting prayer for it. You will grow tall, Puebloan people tell their corn. Robert Mirabal says you cannot know your land or your food until you bend down to pick up a rock from a cornrow. I hope that thought travels on from my own home, many years and miles. Eric Lucas’s new book is Explorers Guide Victoria & Vancouver Island (Countryman Press); visit him online at www.TrailNot4Sissies.com. Learn more about Robert Mirabal at www.robertmirabal.com. If you enjoy the articles on YourLifeIsATrip.com, please visit another great resource and one of our sponsors, Prague-Stay.com, Prague's leading accommodation and lifestyle portal featuring premium serviced apartments, Prague boutique and design hotels, plus Prague lifestyle information.